[SECOND CONTINENTAL CONGRESS]. Newspaper. 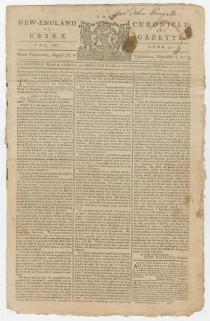 The New-England Chronicle, or the Essex Gazette. August 31-September 7, 1775 (Vol. 8, No. 371), Cambridge, Massachusetts: Samuel Hall and Ebenezer Hall. 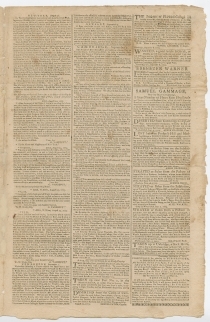 Includes front-page printing of Opinion of Congress in Response to Lord North’s Conciliatory Proposal (July 31, 1775), written by Thomas Jefferson, signed in type by John Hancock; and Resolution of Congress Clarifying Non-Importation Agreement (August 1, 1775). The original subscriber to this issue was Dr. John Wingate (1743-1819) of Hallowell, Maine (Massachusetts), who served as an army surgeon in the Revolutionary War. 4 pp., 10 x 15½ in. Convening in Philadelphia in September and October 1774, the First Continental Congress met to consider a unified response to the British Parliament’s Intolerable Acts. Delegates agreed to boycott British goods beginning on December 1, 1774, and threatened to boycott the West Indies if those islands did not agree to non-importation of British goods. Congress also declared that if the Intolerable Acts were not repealed by September 10, 1775, the colonies would cease exports to Britain. They also called for a second meeting the following spring. The Second Continental Congress convened on May 10, 1775, in Philadelphia, Pennsylvania, with delegates from twelve of the thirteen colonies present; Georgia’s delegates arrived in mid-July. On June 14, the Congress created the Continental Army out of militia units besieging the British army in Boston and appointed George Washington to command it. On July 6, Congress approved a Declaration setting forth the Causes and Necessity of their taking up arms, and two days later, extended the Olive Branch Petition to the British Crown to seek reconciliation. Meanwhile, in February, Prime Minister Lord North (1732-1792) had taken an unexpectedly conciliatory tone, which he proposed to the House of Lords on February 20 and dated February 27. Parliament sent it to the individual colonies in North America. The resolution read: “Resolved, That it is the opinion of this Committee, that when the Governour, Council, and Assembly, or General Court, of any of his Majesty’s Provinces or Colonies in America, shall propose to make provision, according to the condition, circumstances, and situation of such Province or Colony, for contributing their proportion to the common defence, (such proportion to be raised under the authority of the General Court, or General Assembly of such Province or Colony, and disposable by Parliament,) and shall engage to make provision also for the support of the Civil Government, and the Administration of Justice, in such Province or Colony, it will be proper if such proposal shall be approved by his Majesty and the two Houses of Parliament, and for so long as such provision shall be made accordingly, to forbear, in respect of such Province or Colony, to levy any Duty, Tax, or Assessment, or to impose any farther Duty, Tax, or Assessment, except only such Duties as it may be expedient to continue to levy or to impose for the regulation of commerce; the nett produce of the duties last mentioned to be carried to the account of such Province or Colony respectively.” While the loyal colony of Nova Scotia accepted the proposal, others did not. The New Jersey Assembly forwarded the resolution to the Continental Congress on May 26, 1775, and the legislatures of Pennsylvania and Virginia also forwarded it to Congress. Two months later, on July 22, Congress appointed a committee consisting of Benjamin Franklin of Pennsylvania, Thomas Jefferson of Virginia, John Adams of Massachusetts, and Richard Henry Lee of Virginia to “take into consideration” and report on Lord North’s resolution. At the request of the committee, Jefferson wrote the report. On July 31, Congress considered the committee’s report, debated it by paragraphs, and passed it. The following day, Congress clarified the extent of the upcoming ban on imports from and exports to Great Britain, set by the First Continental Congress to go into effect on September 10. In addition to Great Britain, Ireland, and the West Indies, the ban on imports and exports would extend to the Channel Islands, the Isle of Man, all islands in the Caribbean, “to whatever state, power or Prince belonging,” and colonies on the South American mainland. “That the colonies of America are intitled to the sole and exclusive privilege of giving and granting their own money; that this involves a right of deliberating whether they will make any gift, for what purposes it shall be made, and what shall be its amount; and that it is a high breach of this privilege for any body of men, extraneous to their constitutions, to prescribe the purposes for which money shall be levied on them, to take to themselves the authority of judging of their conditions, circumstances and situations, and of determining the amount of the contribution to be levied. “Desirous and determined as we are to consider in the most dispassionate view every seeming advance towards a reconciliation made by the British parliament, let our brethren of Britain reflect what would have been the sacrifice to men of free spirits had even fair terms been proffered, as these insidious proposals were with circumstances of insult and defiance. A proposition to give our money, accompanied with large fleets and armies, seems addressed to our fears rather than to our freedom. With what patience would Britons have received articles of treaty from any power on earth, when borne on the point of a bayonet by military plenipotentiaries? Resolved, That under the prohibition, in the said Association contained, to export to or import from the islands of Great-Britain and Ireland, this Congress intends to comprise all exportation to and importation from the islands of Jersey, Guernsey, Sark, Alderney and Man, and every European island and settlement within the British dominions; and that, under the denomination of West-Indies, this Congress means to comprehend all the West-India islands, British and foreign, to whatever state, power or Prince belonging, or by whomsoever governed, and also the Summer islands, Bahama islands, Berbicia and Surinam on the Main, and every island and settlement within the latitude of the southern line of Georgia and the equator. 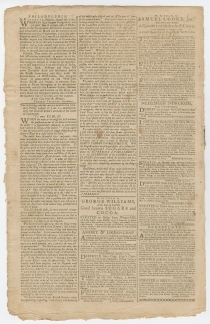 This issue also includes an address “To General Burgoyne” from “A Countryman”: “You say we deny the right of British legislation to impose taxes and consequently struggle for total independency. 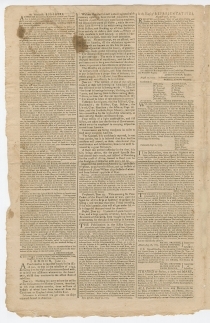 This argument is unkind and fallacious…” (p2/c1); public letters denouncing Governor Hutchinson as “an Enemy to our once happy Constitution” and “one of the greatest Enemies of our natural and charter’d Rights” (p2/c3); four letters by Captain G. Vandeput of the HMS Asia to Whitehead Hicks, the mayor of New York, explaining that he fired upon a battery to prevent the removal of cannon “belonging to the King” and returned fire when fired upon (p3/c1); local news from Cambridge that one of General Gage’s soldiers was killed while cutting down a Liberty Tree in Boston and that John Hancock had married Dorothy Quincy, daughter of Edmund Quincy (p3/c2); and a reprinted letter “To the Public” from a British citizen in the London Public Ledger comparing British and American accounts of the Battles of Lexington and Concord and defending the Americans: “It is a shameful fallacy to talk about the SUPREMACY of PARLIAMENT; it is the DESPOTISM of the CROWN and the SLAVERY of the people which the ministry aim at; for refusing those attempts, and for that only the Americans have been inhumanly murdered by the King’s Troops. Englishmen, weigh these things with deliberation; make the case your own; if the massacre of brethren will not open your eyes, they deserve to be for ever shut against your welfare.” (p4/c1-2). Jersey, Guernsey, Sark, and Alderney are all Channel Islands between the United Kingdom and France; the Isle of Man is in the Irish Sea between the United Kingdom and Ireland. Berbicia was a Dutch colony along the Berbice River in South America from 1627 to 1825, when it was ceded to the United Kingdom and later merged with other colonies to form British Guiana in 1831. Surinam was a Dutch colony in South America from 1667 to 1954 that bordered Berbicia.